A gravity toilet has two valves inside the tank. One is the fill valve, normally located on the left side of the tank, and the other is the flush valve, around the center area inside the tank. If you notice tiny bubbles inside the water along either of these valves, the culprit isn't the toilet or its internal parts. The tiny bubbles in the toilet tank are caused by air in the line that supplies water to the toilet. You can locate the end of this line on the wall or floor behind the toilet's left side. A shut-off valve is installed on the end of the pipe, and a tube or hose connects it with the toilet tank. When air is inside the line, it simply travels up into the tank and becomes visible to you as the bubbles along the valves. You can sometimes notice air inside the line without seeing the air bubbles in the toilet. As the tank refills, listen for a sputtering sound as the water shoots out of the fill valve into the tank, indicating air inside the water line. Check how far the shut-off valve on the wall or floor is opened up. This sets the pressure of the water entering the tank. If this pressure is set too high, you might end up with air in the toilet cistern. Remedy this by twisting the shut-off valve to the right, which lowers the water pressure so that it isn't so strong. Be aware that the tank will also now take longer to refill with the lowered water pressure. The remedy to get rid of the tiny bubbles is simple. All you do is continue using the toilet. Continue flushing it normally throughout the day, and eventually the air inside the line will work itself out. If you want to get rid of the tank bubbles even faster, repeatedly flush the toilet and allow it to fill back up with water again. Eventually the water inside the tank will be devoid of any bubbles. In addition to flushing the toilet to work the air bubbles out of the tank water, you can also open up the cold water on the bathroom faucets that are near the toilet. 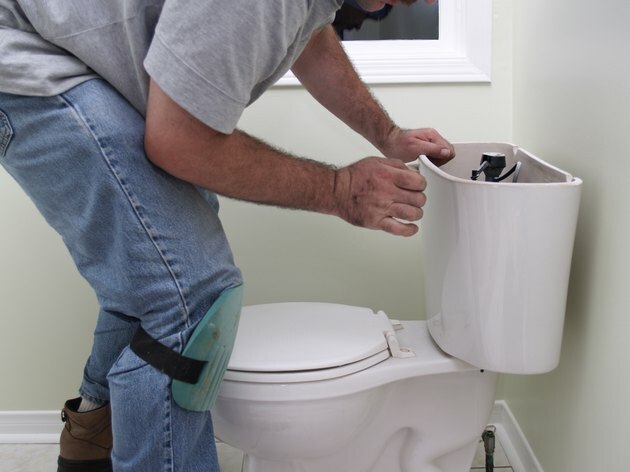 Although this won't remove as much of the air inside the line as flushing the toilet does, having the faucets open does help to get a little of the air out of the pipes.